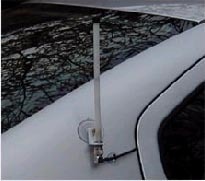 Suction cup 7 dBi antenna: Mike from Signull Techologies sent me the URL of a spec sheet for their 7 dBi suction cup antenna pictured deployed on automobiles! Wardriving made easy. Joi Ito - "Antenna for wardriving..." by Joi Ito is licensed under a Creative Commons Attribution 4.0 International License.